Zorro is getting ready for a new off-screen adventure in motorcycle grand prix racing this weekend with the debut of the Moto2 category at the Qatar season-opener. 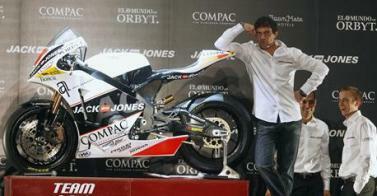 Antonio Banderas who plays the swashbuckling masked outlaw in the popular Hollywood movies, is involved in the 250cc replacement class with his Jack&Jones by Antonio Banderas team. "I am not going to get out Zorro's whip to demand results. I want things to be done without stress," he told Marca. The 600cc bikes all have the same Honda four-stroke engines and Dunlop tyres while the bigger machines will make the category a more suitable training ground and feeder for the top MotoGP class. "I'm convinced that the birth of the new category, with more modest budgets and similar machines, is a good move," added Banderas, who will have American newcomer Kenny Noyes and Spaniard Joan Olive riding for him. "It's true that MotoGP is like the Formula One of motorcycling but I believe that Moto2... seems more interesting than MotoGP because of the level playing field. "I got into this because it will resolve the debate over whether the rider or the bike is more important," said the actor, a keen motorcycling fan who has a house in Marbella and who owns five bikes of his own.